Chris Kreider is an extremely talented, and young winger who is ready to take strides to step up his game for next season. Photo courtesy of MSG Photos. It feels as if Chris Kreider has been a Ranger for a very long time. After making his debut in Game 3 against the Ottawa Senators in the 2012 playoffs, he has since been grouped in with the rest of the “core” group of the New York Rangers organization. But it’s hard to realize that this was only Kreider’s second full year in the NHL. Despite playing in the 2012 playoffs and through the lockout-shortened 2013-14 season, he was still considered a rookie, and was getting some attention for the Calder trophy award, presented to the league’s best rookie. A lot was expected of Kreider this year. After playing in parts of three seasons, fans and hockey analysts expected to him to continue his development into one of the premier power forwards in the league. And for the most part, he delivered, growing as a player and teammate throughout this season. Kreider set career highs in goals, assists, and points this season, surpassing his totals in all of those categories during last season. Kreider managed to reach the 20 goal mark for the first time in his career (21), and added 25 assists for a total of 46 points. That was nine points higher than his 2013-14 campaign point total (17-20-37). He carried over his success from the regular season into the playoffs, finishing with seven goals, which was second on the team, behind only Derick Brassard (9). His nine points were tied with Ryan McDonagh for sixth on the team. His series against the Washington Capitals was absolutely fantastic, dominating the game on almost all of his shifts, and using his unique blend of size and speed to blaze past the Capitals defense. The newly formed line of Kreider along with Derek Stepan and Jesper Fast gelled, and quickly became the best line of the series. 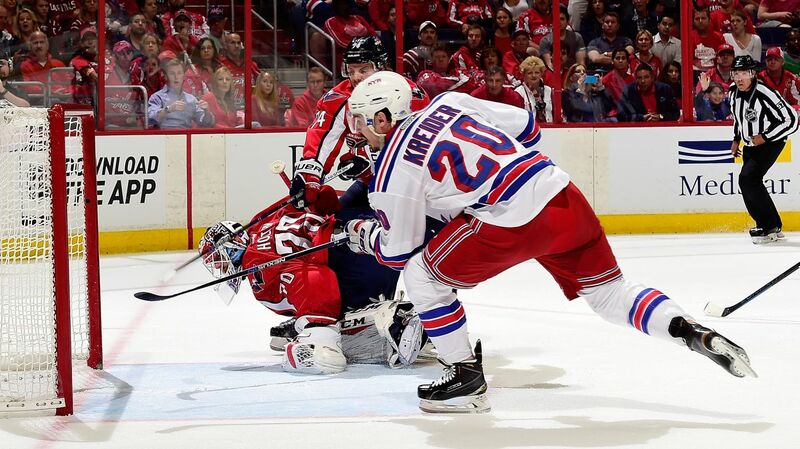 Kreider finished with four goals in the series, including some really big goals. Chris Kreider scored twice in the first period of Game 6 against the Capitals, and was arguably the Rangers’ best forward in that series. Photo courtesy of MSG Photos. With the Rangers just 1:41 from being eliminated in Game 5, and Henrik Lundqvist heading to the bench, it was Chris Kreider sending a wrist shot into the back of the net to send the game into overtime, which would be won later by Ryan McDonagh. He then started out Game 6 strong, scoring a goal in the early seconds of the period, and then connecting on a power play goal with less than a second remaining. That set the tone for the game, and the Rangers would go on to win 4-3. He had flashes of brilliance and dominance in these playoffs, showcasing his potential superstardom in the future. The one problem was that the beast known as Chris Kreider wasn’t apparent in every game, or on every shift. Although he had four points (2-2-4) against the Lightning in the Eastern Conference Finals, he was held to just two shots in Game 5 and 7, both shutout losses. In the Game 6 win, Kreider had no shots on goal, but the line of Rick Nash, Derick Brassard and JT Miller were able to step up and combine for 5 goals. 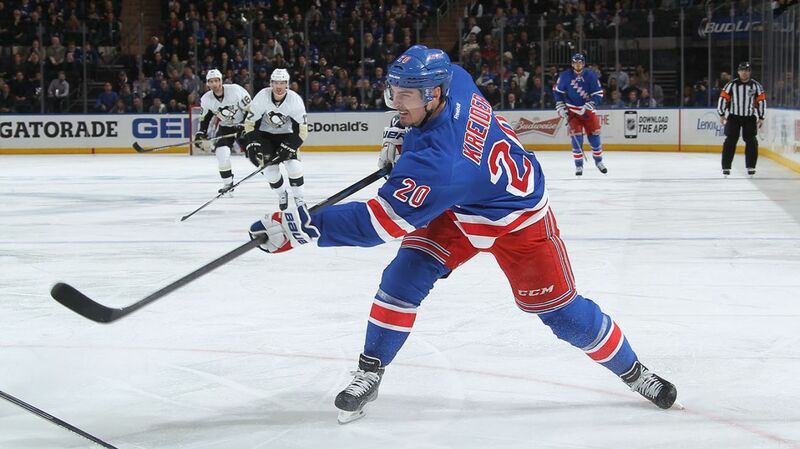 Kreider knows that he needs to continue his growth and evolution into a star. He has the perfect size and build of a power forward, and has shown his skills in different ways. With the Rangers pressed up against the salary cap, they need some of their cheaper contracts to be big contributors. In order to do that, the 24 year old forward will be taking multiple steps to continue to develop and become more confident in himself. One of those steps is visiting a sports psychologist, a trend that is on the rise in the world of profession sports. Some other NHL players have had success when visiting a sports psychologist, including Montreal’s Lars Eller. After struggling during the 2012-13 season, and being a healthy scratch, Eller was dealing with some severe confidence issues and emotional issues, so he met with Dr. Sylvain Guimond, the Canadiens’ sports psychology consultant, with good results. Pittsburgh Penguins goalie Marc-Andre Fleury also consulted with a sports psychologist following a particularly rough 2013 season, and it helped him bounce back as well. Fleury had a strong season this year, and did everything he could to keep the Penguins in every game against the Rangers in the playoffs. “It’s another tool,” Fleury said. “It’s something that can help you perform, so who not give it a try? I think it was an opportune time to meet with him.” (Via NBC ProHockeyTalk). 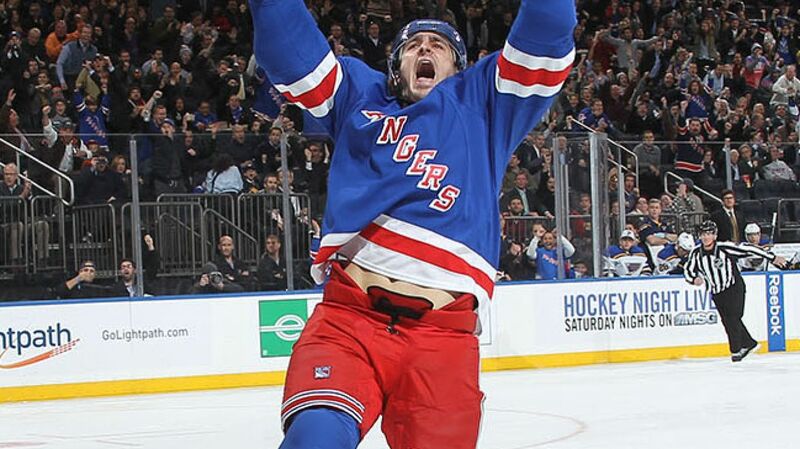 Chris Kreider is clearly a very passionate player, with an incredible skillset that could make him a top scorer in the NHL one day. Sometimes, his emotions get the better of him, causing him to take a penalty or an unnecessary hit, like when he was kicked out of the game against the Minnesota Wild on October 27th. Then he may play timid and reserved, not playing to his full potential. Kreider is an extremely passionate player, and if he can channel all of that emotion into his game, he could grow into an even better player. Photo courtesy of MSG Photos. If visiting a sports psychologist can help him channel all of his emotions and passion into his game, then Kreider could see a drastic improvement in both his performance, and more importantly, his confidence. That dedication to his teammates and improving himself will get him far. I truly think he has the skills to be a 30 or 40 goal scorer one day, and become one of the best power forwards in the league. Not only is he big and strong, he’s also one of the fastest skaters in the NHL once he gets going. If he is able to shatter any issues or barriers that are holding him back, opposing teams will have to deal with a new kind of beast. Thanks to FullTiltNYR for gathering all of the quotes regarding Chris Kreider. You can read that article here. Posted on June 4, 2015, in Rangers Updates and tagged Alain Vigneault, Chris Kreider, Derek Stepan, Derick Brassard, Jesper Fast, JT Miller, Kreider, New York Rangers, NHL, NY Rangers, NYR, Rangers, Rangers Nation, Rangerstown, Rick Nash, sports psychologist, sports psychology, Stanley Cup Finals, The Ranger Zone. Bookmark the permalink. 2 Comments.